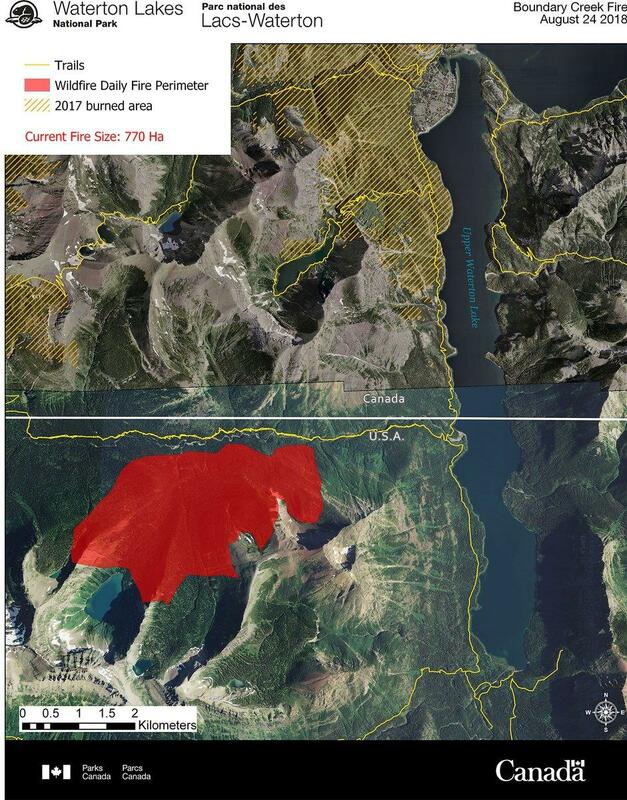 A map showing the perimeter of the Boundary Creek Fire burning along the Candian Border near Waterton National Park, August 24, 2018. The Boundary Fire has burned about 1,200 acres as of this morning, and caused the the evacuation of a campground and hiking trails in the Goat Haunt area of Glacier. John Stoesser is a fire information officer for Parks Canada. He says Parks Canada began an initial aerial attack on the fire west of Upper Waterton Lake Thursday night, but, "At that time they determined it was not feasible to be able to use a helicopter bucket to attack it." Both Parks Canada and Glacier National Park are fighting the fire, which exhibited extreme behavior. Flame lengths of up to 100 feet were reported. Parks Canada and Glacier National Park staff cleared hikers from the area and evacuated the Waterton River Backcountry Campground in Glacier. The Waterton Townsite in Canada is under a pre-evacuation warning. Goat Haunt in Montana remains accessible by boat. The National Weather Service is predicting potential thunderstorms and gusty winds tonight in and around Glacier National Park. There are currently two large fires burning in the park and several others in the Flathead National Forest. The Service has issued an air quality alert for more than half of the counties in Montana this weekend, with the worst impacts expected in the state’s northwest corner. Air quality is expected to range from Unhealthy for Sensitive Groups, to Very Unhealthy throughout the weekend. Bob Tobin, a meteorologist with the National Weather Service, said at a fire meeting Thursday in Essex that an incoming front on Sunday will carry cooler temperatures into the region, and could bring as much as a quarter inch of rain. "This cooling down will settle things down a little bit, and actually help out with the smoke a little bit, too." Tobin says chilly temps will hang around Monday before warming up mid-week. The three-acre Juliet Fire in the Bob Marshall Wilderness has forced trail closures Spotted Bear Ranger District on the Flathead National Forest. The closures do not currently affect the Continental Divide National Scenic Trail (CDT). White River #112, Wall Creek #90, Bungalow Mtn #243, Spotted Bear Pass Cut across #739 are closed due to fire behavior. The blaze was detected August 22 and is burning south of the Wall Creek Cliffs between Juliet and Pedro Creeks. In the Kootenai National Forest, the Huckleberry Fire, part of the Sterling Complex, ignited a spot fire this morning outside northeast containment lines. Firefighters are responding and will spend today clearing snags and hazardous trees along the fire’s north flank. The fire is estimated at 410 acres with 50 percent contained. Firefighters are addressing the last significant area of concern on the Pinkham Tower Fire’s north-central portion. Crews there are burning the second of three sections needed to safely contain the 855-acre fire’s northern area. The Pinkham Tower Fire is about 28 percent contained. Crews on the entire Sterling Complex are taking advantage of cooler, more humid weather to extinguish heat within 100 feet of containment lines using hoses and pumps. When they’re sure embers, snags and roots won’t reignite, they’ll start repairing containment lines. In Flathead County, fire personnel have responded to two burn pile calls in the past 24 hours and 18 total since fire restrictions went into effect August 16. Open burning, including campfires, are not allowed under Stage 2 restrictions. Smoking is only allowed in an enclosed vehicle or building. Operating a chainsaw during the heat of the day is prohibited, as is discharging a firearm or setting off fireworks. The 2,830 acre Gold Hill Fire 13 miles north of Libby has pushed past containment lines on the southeast and east. The fire has made its way into Noisy Creek on the south and east sides of the fire perimeter. Pre-evacuations were issued for 12 properties on Creekside Road and Pipe Creek Rd from mile marker 11 to mile marker 13. For more information please call Lincoln County EMA at 293-6295. Structure protection crews will be scouting and preparing homes in the area in the event that the Gold Hill fire does move into the area of the private properties. The evacuation order on Pipe Creek Road that was in place today has been lifted and firing operations cancelled due to weather conditions. Fire managers will continue to monitor conditions and continue with firing operations when appropriate. Today, firefighters are focused on the south and southeast flanks of the fire, improving contingency lines. They’re also working on creating fuel breaks along Noisy Creek Road and Blue Creek Road. This fire is being called one percent contained. Inciweb says: “With additional resources arriving a night shift operation has been implemented. Crews will be assessing the potential for firing and holding operations and monitor fire behavior as it burns through the night. As weather and smoke conditions permit, fire fighters will continue to utilize air resources to help slow the progression of the fire to the south and southeast. The weather in the area is expected to be mild with a temperature of 73-78 and winds out of the east around 10 mph. Tonight temperatures will get down into the 40’s and winds Northeast 5-11 mph. The Kootenai National Forest has issued an area closure. Please go to this link for details. There will be hard road closures in the fire area. The Big Creek Baldy Lookout will also be closed. 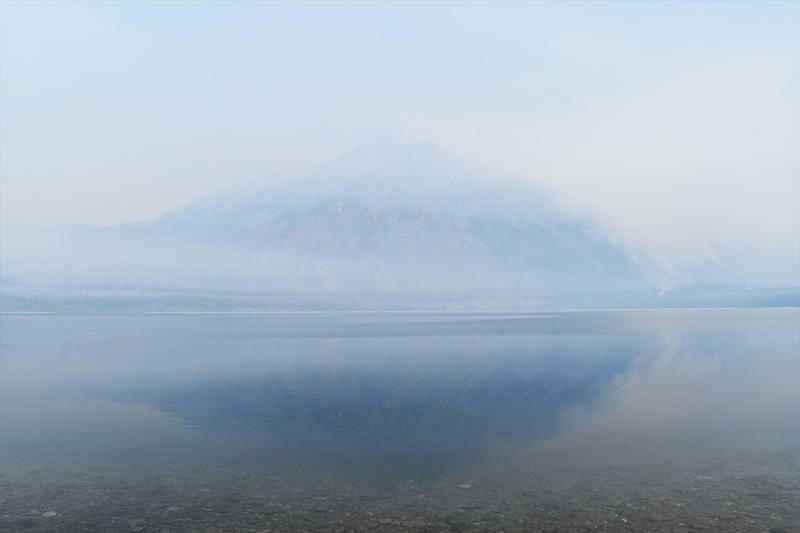 Parks Canada has closed all of Waterton Lakes National Park, including all waterbodies, except for the Waterton Townsite and Highway 5/6 and Chief Mountain Highway, due to the Boundary Fire burning about 1,200 acres on the US side of the Canadian Border. All backcountry areas and hiking trails in Waterton Lakes NP are currently closed. Parks Canada staff evacuated backcountry campgrounds and swept trails in Waterton yesterday evening. An evacuation alert was shared door-to-door for communities in the Park. Waterton Townsite remains open, but visitors are advised that an evacuation alert is still in effect. The fire was spotted at about 6 p.m. yesterday near Boundary Creek in Glacier National Park and quickly grew through dry fuel spurred by strong winds. Initial air attack assessed the fire and determined air suppression would not be successful. As of 11:14 a.m. Friday, the fire was still on the south side of the Canadian border in Glacier National Park. Glacier is putting up structure protection measures in the Goat Haunt area. Parks Canada is installing structure protection at Boundary Bay and Bertha Bay backcountry campgrounds. Parks Canada will bring additional structural protection resources to the Waterton Townsite if necessary. Air resources will be used today as conditions allow to slow the fire’s spread east toward Waterton Lake. 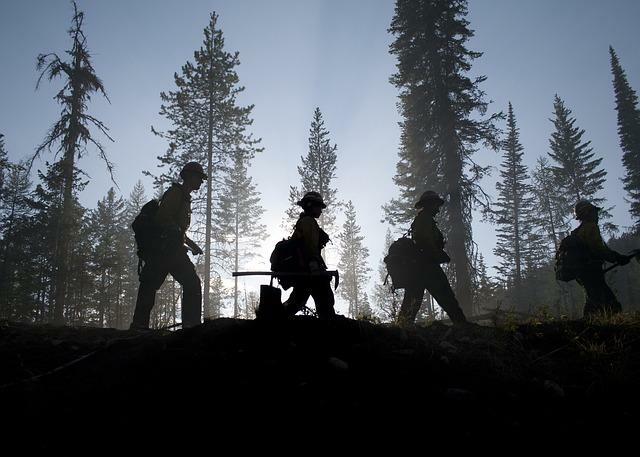 On the Howe Ridge Fire burning 10,800 acres along the north shore of Lake McDonald, firefighters made “excellent progress” reinforcing existing trail systems and roads. Fire managers say they consider these fire containment lines prepped and ready if the fire reaches them. Today is predicted to be a dynamic weather day, with gusty winds expected as a cold front moves through the area. Thunderstorms are possible in the northern regions of Glacier National Park. Yesterday crews dropped ping pong ball-sized fire igniters to create a uniform edge on the fire’s north flank to protect Going-To-The-Sun Road. A sprinkler system is set up on the Upper McDonald Creek trails to act as a fire line in case the fire moves downslope toward Going-To-The-Sun Road. The southwest edge of the fire continues to back toward the Inside North Fork Road. Firefighters and heavy equipment are removing dead trees and brush so the road can act as a fire break. Structure protection is in place in the Fish Creek Campground. Glacier National Park remains under a Stage 2 fire restriction, which means campfires are not allowed. Evacuation orders remain in place for the Fish Creek, Avalanche and Sprague Creek Campgrounds, Lake McDonald Lodge and private residences along North McDonald Road and Going-To-The-Sun Road. Apgar area is under a pre-evacuation warning. All park areas north of the Bowman Lake Road junction are also under a pre-evacuation warning due to the Whale Butte Fire burning 327 acres on the Flathead National Forest adjacent to the Park. Wildfire activity has moderated in Western Montana in the wake of wet and cool weather earlier this week, but crews remain hard at work as temperatures start to rise again .